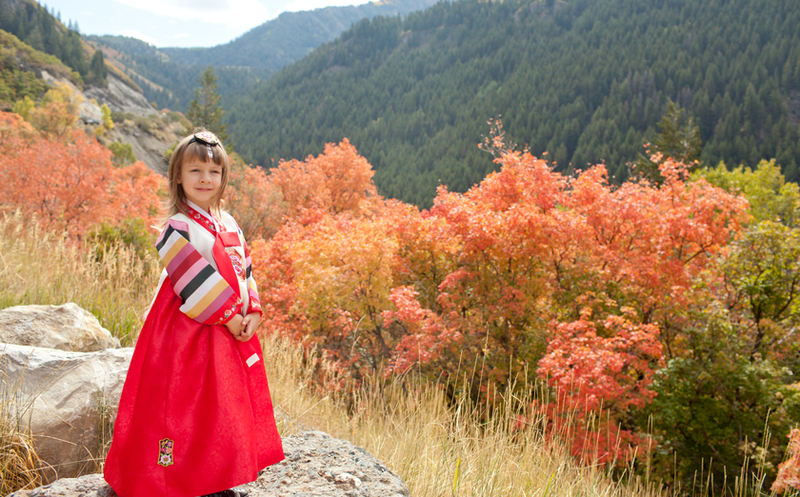 On Wednesday afternoon Mimi and I decided on the spur of the moment to drive up the canyon and check out the fall leaves…and we took her Korean hanbok with us! It’s already a little too short on her and I wanted to get some pics before she completely outgrows it. 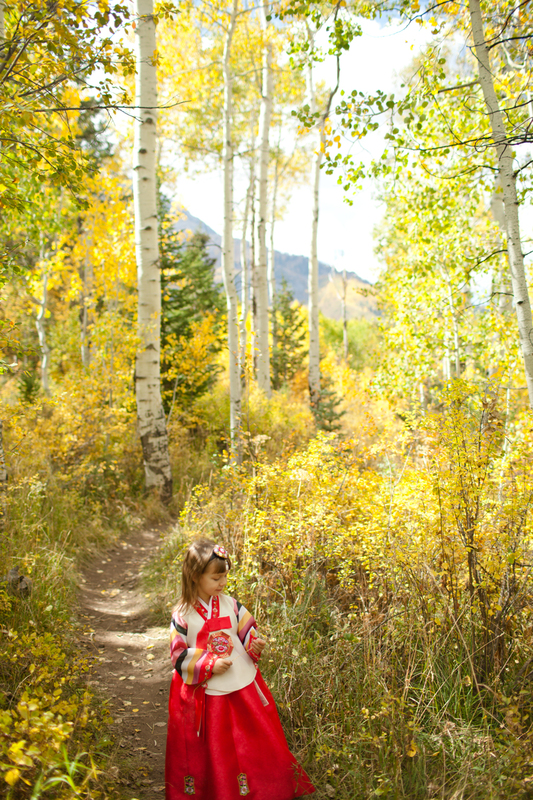 I’m glad we made the effort to go up in the canyon because the first big storm of fall blew in and most of those leaves are probably gone now. Just one more instance of the universe bonking me on the head with the message that time is fleeting. Happy belated Lunar New Year! I’ve been making some progress on my new year’s resolutions: exercising (I’ve been going to spin class on Mondays and a weight-lifting class two days a week); learning Spanish (using Duolingo on my phone), and writing in my 5-year diary. I haven’t made much progress on decluttering my house, though. I bought Marie Kondo’s book, The Life-Changing Magic of Tidying Up , and put it on my coffee table a few months ago but not much has happen yet. Weird, right? I wanted to share this video of the Korean pop group Stellar performing the choreography of their song “Sting” wearing their hanbok for Lunar New Year. It’s just something they taped at their studio but it’s cute. N and the kids are off on Monday and I’m really looking forward to having a day off from our weekday routine. And maybe getting caught up on laundry–dare to dream! 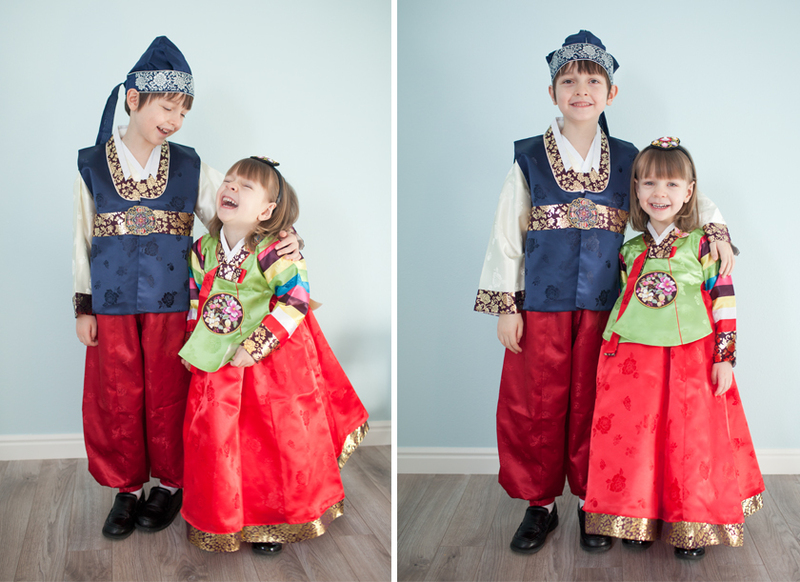 My mom brought the kids new hanbok back from Korea a few months ago and so we took a few pictures of them for New Year’s day. 2014 had its ups and downs for us and I’m looking forward to a fresh new year…and part of that is blogging! I’ll be posting 2-3 times a week so get ready to dust off your RSS reader like it’s 2008. 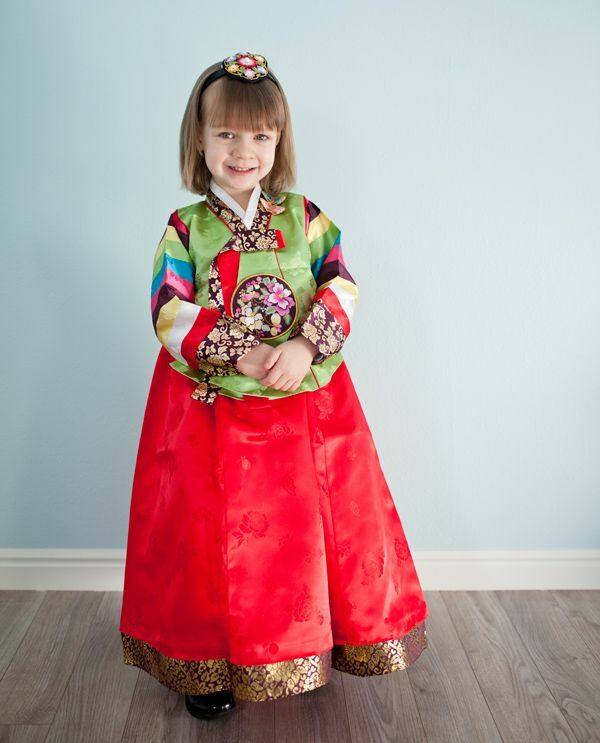 Author FaithPosted on January 1, 2015 January 27, 2016 Categories dressed up, E., Korean, Mimi, photos (favorite)4 Comments on Happy New Year! And now for something very different, here’s a fun mashup of some of the top Kpop hits of 2014 so far. Some of my favorite Kpop groups have new songs coming out in the next few months–so excited! I’ve heard good things about Korean digital or setting perms but there are no salons in Salt Lake City that offer them. So when I was up in WA I decided to take advantage of the opportunity and get one. Crazy looking, right? This machine is imported from Korea and uses heat and ceramic rollers to set the curls. My mom took me to the Korean stylist she frequents. I was scared of ending up with an ajumma hair style, worries that were not assuaged when the stylist was sporting a very ajumma-ish hairstyle herself and didn’t speak much English. 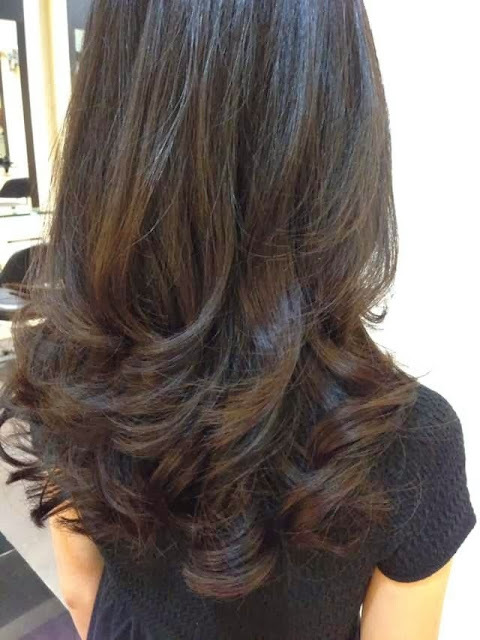 But I showed her photos of what I wanted and she said that a setting perm and a cut with lots of layers would give me the style I wanted. I think she could tell I was a little nervous so she admonished me to trust her, so I did. Don’t mess with an ajumma! The curls/waves are supposed to last for 6-12 months and are really low maintenance. My stylist said if I want more pronounced curls to twist my hair into ringlets as I blow-dry it or that I could just towel-dry my hair for looser waves which is what I usually do (and what I did in the photo above). If I feel like getting fancy I’ll put my hair up in two buns overnight and in the morning I have a ton of curls. This is the first time I’ve done anything major to my hair and happy (and relived!) with how it turned out. The whole process (cut-perm-style) took about 3 hours. I don’t remember all the different steps but Karen Cheng, an Australian blogger I follow, has a good post about her experience getting a similar perm. I think I enjoyed watching this number much more than the bride did. Poor girl looks stunned. I hope you have a great weekend! We’re trying to muster the courage to take both kids to a movie tomorrow. It will be Mimi’s first time going to a theater. She’ll do fine…right? Gulp. Way back in 1999, before we were dating or even very good friends N and I went on a study abroad trip to Korea with our professor Mark Peterson…and a Korean film crew followed us around and made a documentary! I have a VHS tape of it somewhere, but our professor just uploaded the whole thing to Youtube so N and I just watched it again for the first time in over a decade. I’m so thankful that this documentary exists. I am fascinated to see how very young we all were–I was only 18 at the time and in the process of figuring out who I wanted to be and what I wanted out of life. 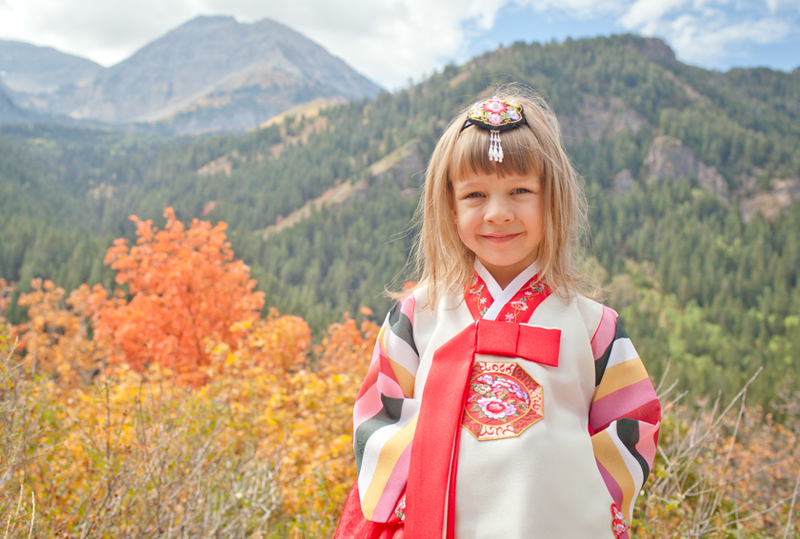 Our trip changed my life: it helped me figure those things out and connect more with my Korean heritage. 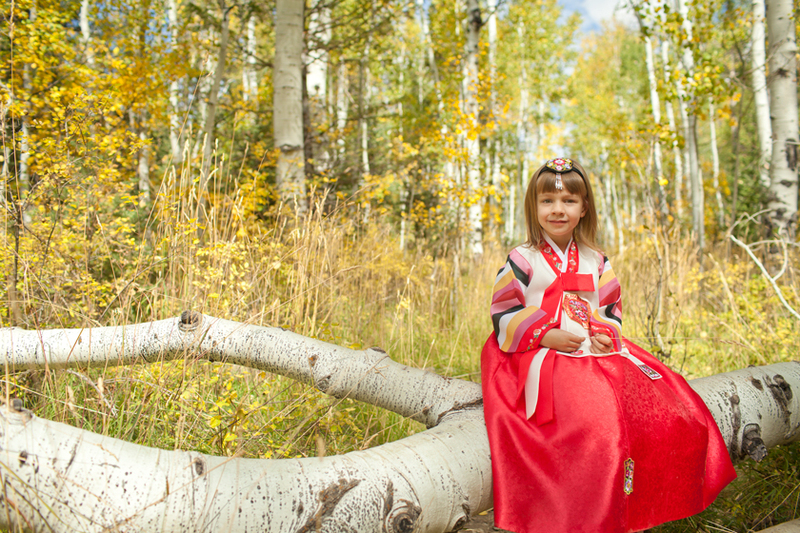 When I was pregnant with Mimi we visited Korea and my cousin gave us a hanbok (a traditional Korean dress) for the baby. If I had been on the ball about things when Mimi turned one I would have dressed her in it and taken pictures and had a little dol for her. Mimi recently found her hanbok in her closet and now, being a lover of all things frilly, she begs to put it on whenever she gets the chance. It’s sized for a one-year-old but she can juuust squeeze into it. 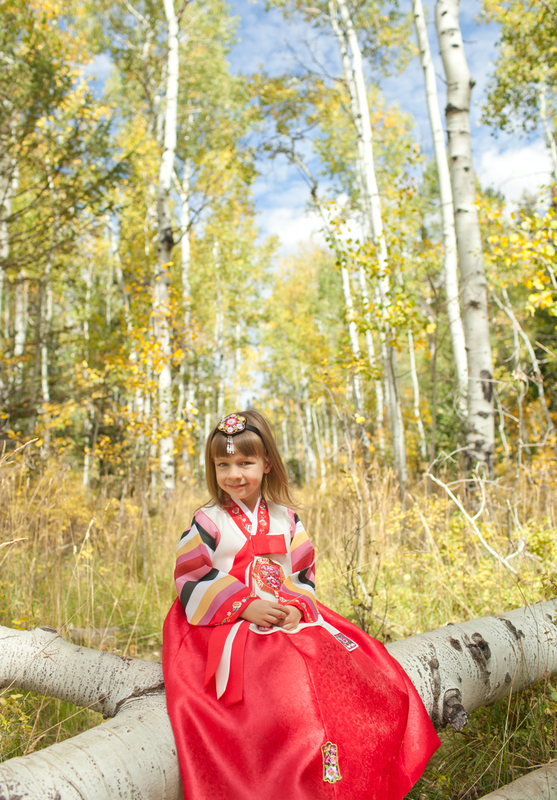 My aunt is coming to visit this summer; maybe I’ll see if she can pick up another hanbok for our little blue-eyed, quarter-Korean girly-girl. N made me another K-pop mix cd last night and I’ve been enjoying it as I’ve been driving around with the kids today. This song by Glam is on a previous mix cd but it’s a favorite of mine and one the kids request often.